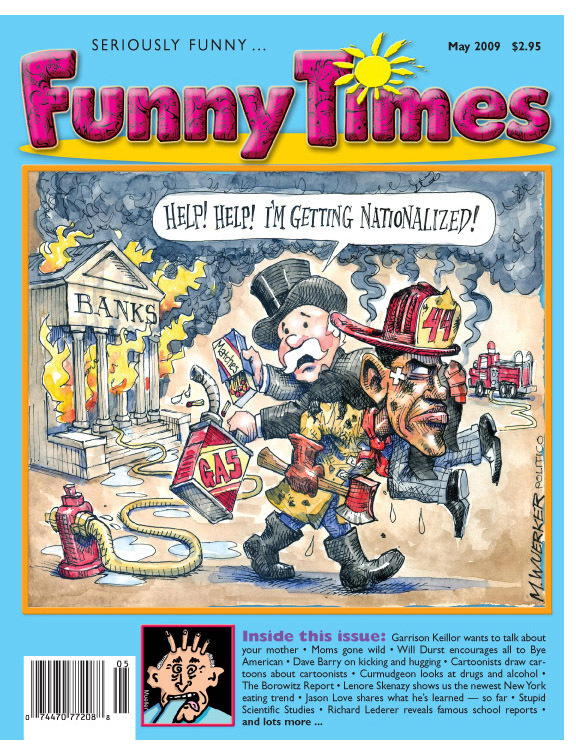 The May 2009 Funny Times is out! How cool to find my name and essay in between those by Garrison Keillor and Dave Barry. The piece, Moms Gone Wild, is about my Real Mother – My Mom. Cartoons by: Isabella Bannerman, Bizarro, Harry Bliss, Ruben Bolling, Matt Bors, Randy Glasbergen, Martha Gradisher, Ham Khan, Keith Knight, Life In Hell, Tim Lockley, Mary Lawton, Chris Monroe, Carlos Montage, P.S. Mueller, Mark Parisi, Joel Pett, Ted Rall, Andy Singer, David Sipress, Barbara Smaller, Jen Sorensen, Tom Toles, Tom Tomorrow, P.C. Vey, Dan Wasserman, Shannon Wheeler, Matt Wuerker … and lots more!